Categories: Uncategorized | Tags: advice, back to school, flowers, inspo, love, photography, sky, summer, teach | Permalink. 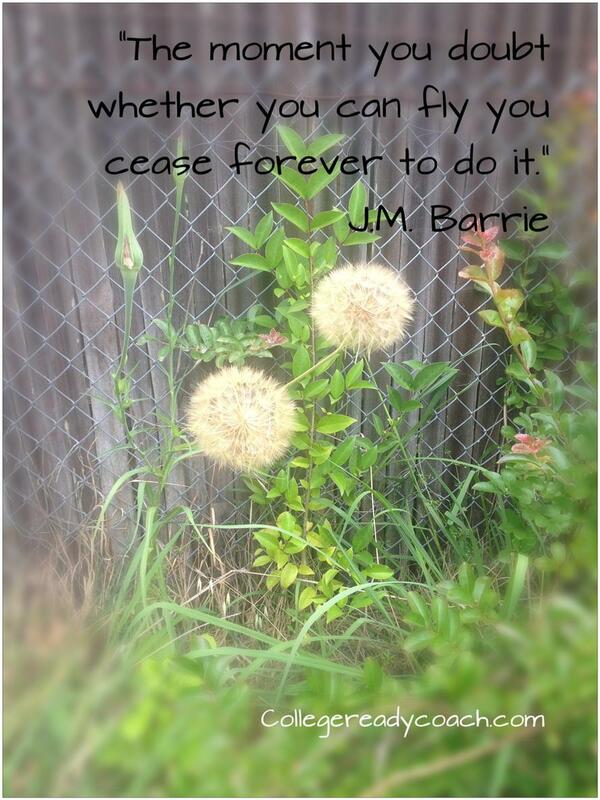 This advice is from J.M Barrie’s Peter Pan…and it works for all of us. Never stop believing in your goal. Or, if you notice that you do stop believing…it’s probably time to find the next goal or chapter in your life. Because you? You were meant to FLY! Happy Tuesday, Happy Summer…happy life! Categories: Education, Happiness, Nature, Quotes, Reading, Teaching, Writing, zen | Tags: books, College Life, collegereadycoach, Disney, dream, english_musings, happiness, inspiration, inspo, J M Barrie, life, nature, Peter Pan, photography, quotes, Reading, summer, teaching, writing, zen | Permalink. I love you both. And I love teaching! And all the optimism, opportunity and rewards that come along with it. It’s my first day! Wish me luck! When do you go back to school? Are you excited? Ready? What do you like best about the first day? For me…it’s that sense of starting a brand new adventure. New students. New faces, New dreams. Being in a room filled with dreamers is a wonderful feeling. Have a great start to a great year. Categories: College, Education, Teaching, Uncategorized, Writing | Tags: back to school, bts, college, college admissions, college coach, College Life, college students, dreams, education, happy teacher, higher ed, inspiration, namaste, opportunity, school, students, summer, teaching, typewriter, writing, zen | Permalink. It’s Summer. 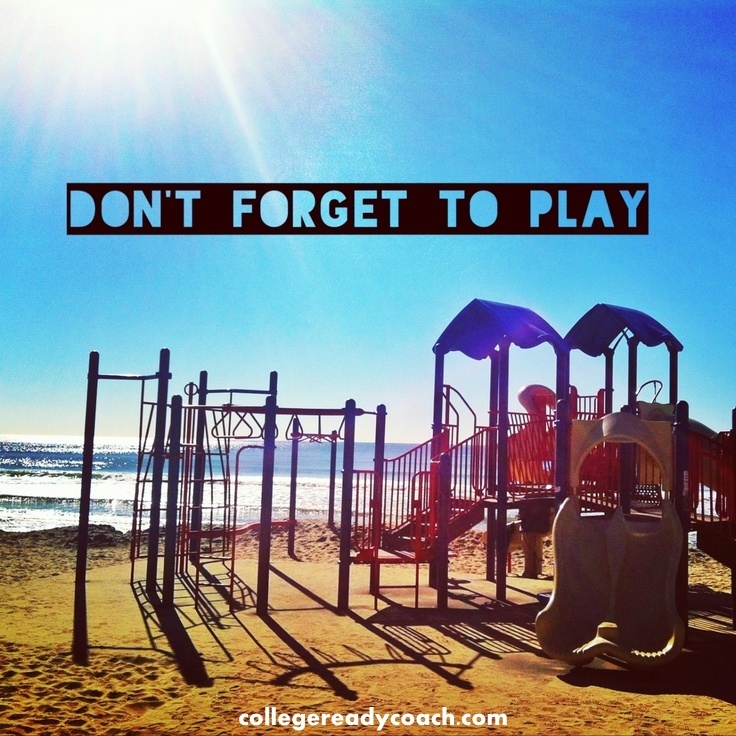 Don’t Forget to Play. Unwind. Unplug. Do more of what you love. Get outdoors. Put your toes in the sand. Read a book just for pleasure. DON’T take any notes. Take a digital detox. Let go of schedules. Remember what infinite possibility felt like…that’s summer! Categories: Education, Happiness, Holiday, Professional Development, Uncategorized | Tags: advice, buddha, children, digital detox, education, happy, play, summer, vacation, zen | Permalink. Subtitle: How to take a nap and be productive at the same time. Hello, sunshine, ice cream cones, fireflies, warm nights and even warmer days. Hello, July! College Ready will be on semi-hiatus for the month, while we recharge, refresh, & unplug a bit, with our family and friends. Why take a summer break? Well, you will find that your ability to be productive has a direct correlation to your ability to kick off your flip flops and plant your toes in the sand every once in a while. We all need to take the V-word (vacation) every now and again, so that we can come back renewed and ready for new challenges and opportunities. Categories: Education, Happiness, Holiday, Professional Development, Social Media, Teaching, Uncategorized | Tags: classroom, college, Facebook, happy, happy teacher, inspiration, inspo, recharge, Social media, summer, vacation, zen | Permalink. Make sure your students continue to read this summer. Reading leads to greater success in both college and career, and greater engagement in community events and civic issues that are important to us all. Reading truly is the road to success. Categories: College, Education, Reading, Teaching, Uncategorized | Tags: books, children, college, edtech, education, education infographic, ereaders, kids, literacy, parents, Reading, summer, summer slide, teachers | Permalink. Ahhh, Summer. To students, it means freedom and fun and lazy days with friends. With so much free time, this could also mean the perfect opportunity for your teen to try out volunteering at a local non-profit. Often, teens need community service for a high school requirement. Others want to volunteer as part of their preparations for applying to colleges and universities. But that isn’t what summertime is all about. Summer is about the unknown, trying new things, and finding new paths. That’s why trying on a new role as a volunteer is the perfect way to help others and have some fun in the sun! Endless opportunities exist for teens to get their feet wet and find an authentic way to get involved. Some teens will love the fast pace of organizing a soccer match at a youth camp, while others will love the serenity of restoring a park trail. One simple suggestion–I am a big fan of libraries, and summer reading programs. These programs often use kids as young as 13 as volunteers to sign up participants, and help run events. It gives your child a chance to start small. Typically, a teen volunteers for a one-two hour shift just once a week. These programs couldn’t run without the help of the teens who show up each summer. Check out what is going on locally this summer in your area and you just might find you have a teen that wants to get involved. A quick and easy web search will help you find an organization in need. One great resource is VolunteerMatch.org. They’ve connected over 7.9 million volunteers with opportunities to help in their communities. Community service isn’t just a buzz word for a college application. It’s about all the good we do, and the good we feel, when we help others in need. Major League Baseball Action Teams: Goups of high school students who plan volunteer events. They receive support from Major League baseball players & inspire others to volunteer. Categories: College, Education, Happiness, Teaching, Uncategorized | Tags: children, classroom, college, college admissions, college ready, education, happy teacher, help, serve, students, summer, teens, volunteer, zen | Permalink.